High school teacher Emily Everrett wants to add some excitement to her life. But first she must break free from under the watchful eye of her over protective big brother. They say opposites attract and what could be more opposite than Doug, ex Navy, adrenaline junkie, loner and Emily a straight laced, local island girl, high school math teacher? Well when the high school teacher who wants to “live it up” meets the Navy “chick magnet” things happen. Add to the mix her older brother and his former team mate, Billy, who thinks no one, is good enough for his sister; especially a Navy man and you have “Dive into You”. A fun filled story, 4th in the Aloha series, about how a one night stand turns into a “hide the relationship” from older brother romance. All because Doug breaks rule number two – “Never mess with your buddy’s sister”. Chris has written a fun filled, unexpected romance for two wonderful new characters. 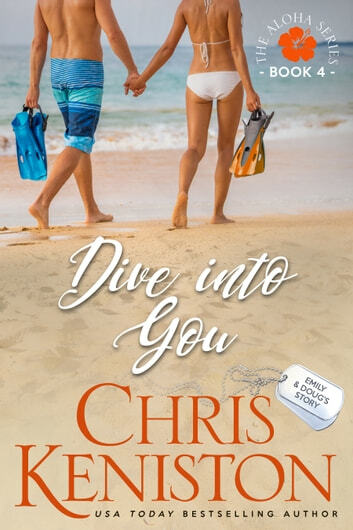 While our friends from the Big Island Dive Shop are around and at times very “helpful”, it is not necessary to have read the other books to enjoy “Dive into You.” It’s a wonderful addition to the Aloha Series. This book not only has a fun story line, there are gems of one liners through out the book. My favorite takes place early in the book at the Naval wedding reception of Lexie and Jim (characters from Mai Tai Wedding) “there’s mind boggling eye candy all over the place, I think half of Pearl Harbor flew over for the day.” “Yes, wasn’t that nice of them.” I can just picture a room full of Navy men in dress whites! I highly recommend this book for anyone who is looking for a fun romance. When you finish it you’ll be hooked and I’m sure if you haven’t already, you will want to read the rest of the Aloha series. Happily Ever after for veterans. Another wonderful love story in a great series. Read them all. Adjusting to life after the military is hard but with the bonds of friendship and support of those who love you happily ever after is out there for our veterans.